I have a friend whose family used to keep goats. Goats are friendly little demons and always VERY interested in whatever you are doing. So anything productive that a human might do is very interesting to a goat. They like to “help”. And so, within my friend’s family, enthusiastic help that is in fact highly obstructive is known as “goat help”. At work in the mornings, I often think of those goats. I think of them when DUSTY is around. He’s our barn cat. And he likes to “help”. He moves around the stall, parking on top of whatever section of the stall I’m trying to clean. Perhaps he’s showing me where the dirty stuff is? It really is very like my cat at home (Taz the Cat) who likes to park on my laptop keyboard. While I’m typing on it. Cat logic escapes me. Cat help does not. And because this is, after all, a horse blog… Here is a photo of the occupant of the above messy stall. Bernice’s yearling son, Albert. And yes, he’s very tall! When I checked Dressy’s neck today, there was no trace of swelling left. The incision seems to be healed right up. She looks sort of like a patchwork horse, with all sorts of shaved spots. And there are a lot of bits of scurf and scabby spots from clipper burn since they shaved her right to the skin. But the hematoma is all cleared up now. All the swelling is gone from the site of the incision. It was about halfway down over the jugular vein. So I took her out for a short ride. A “WALKING” ride, I told her. This IS walking she told me. Sigh. She has a little trouble with the concept of slow and relaxed. So I encouraged her to eat some grass. She managed to slam on the brakes and rip a couple of huge mouthfuls, but then right back to her big power walk and “ummm… sorry the jog was ACCIDENTAL! I’m walking, I’m walking. Yeesh.” It’s a good thing this mare doesn’t drive a car, I can easily imagine her getting road rage in slow traffic. 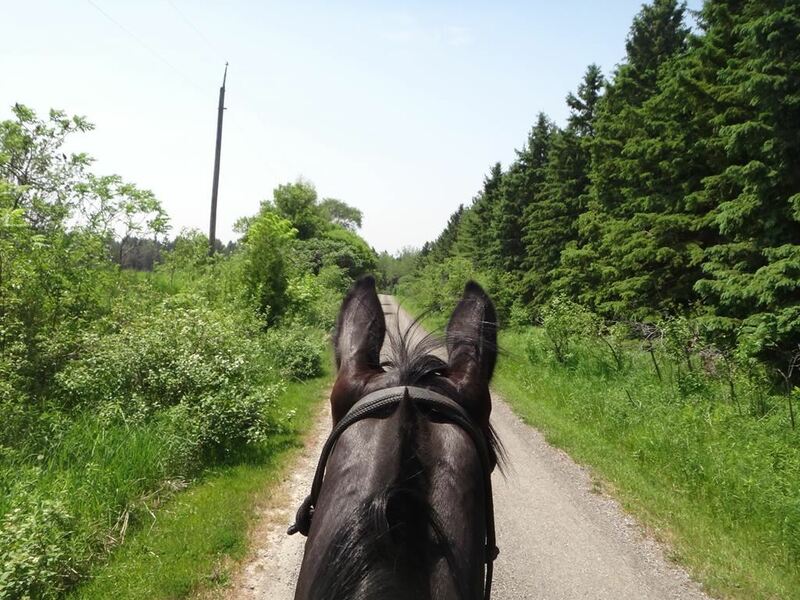 It was only a half hour ride, but she was pretty silly throughout, and it’s HOT out there! So she did break a slight sweat. I borrowed Chrystal’s heart rate monitor to use (to ease my paranoia… though really, it’s not going to tell me much about an arrhythmia). My own has a broken wire. Unfortunately I couldn’t get it working. So I fixed my own with the broken wire, and couldn’t get that to work either. I did check her before and after with the stethoscope. She was 28 before we tacked up, 44 after. And 60 as soon as we got back. All very even with no trace of A-Fib. Is there a monster ahead??? Yes… that is SURELY a monster! I was going to ride Dressy this afternoon, but she had a bit of swelling come up along her jugular vein where the catheter was inserted. It is not bad, and I’m just guessing that maybe she banged it on something and it created a bit of a hematoma. I’m sure it takes a while for the vein to heal (the catheter was quite enormous!). But I have a call into the vet anyway just to make sure it’s not something to get into a panic about. 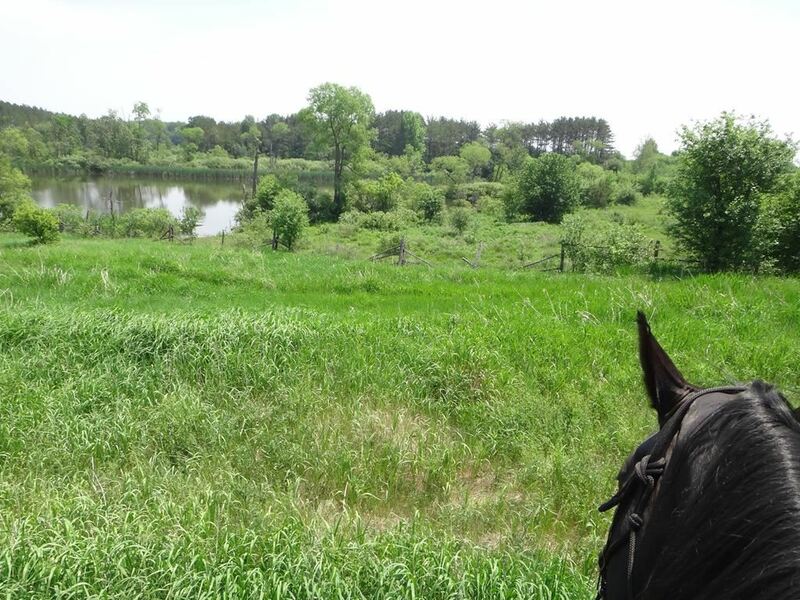 So, since I was dressed to ride, and haven’t been out for a couple of weeks… I looked around my paddocks to see who showed any interest in visiting with me. Ares volunteered, so I brought him in, and cleaned him up some. He was looking a bit uncivilized and feral, so I got out the scissors and trimmed some of the shagginess away. 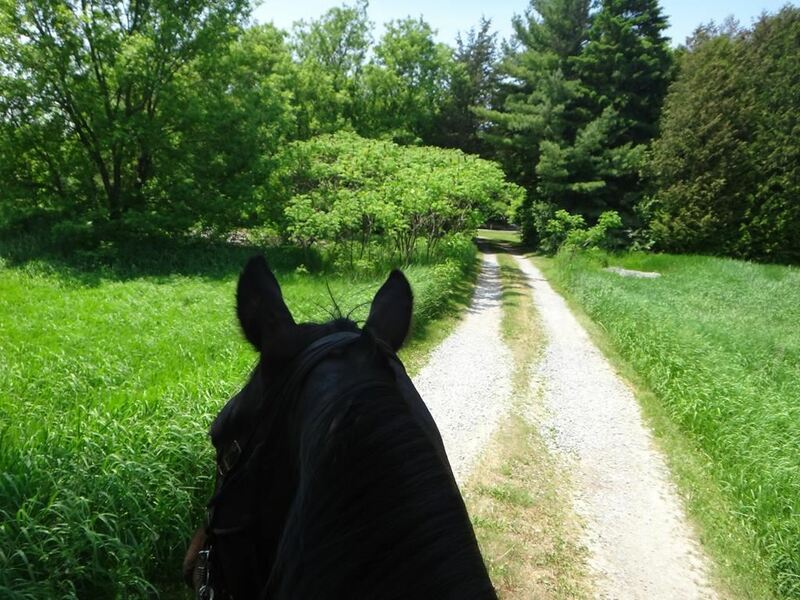 His bridle path was about four inches long and standing straight up in a mohawk. And his fetlocks are long and a bit curly. He stood very nicely while I snipped away at it all. It’s not a show clip by any means, but he looks a little more “kempt” now. He really loves attention and he was being so good, that I decided it was time to start riding him again. So I tacked him up. It was hot today, and my crash vest is far too bulky. But I put it on anyway (along with my helmet of course). Ares is a good little guy, but he’s only been backed a few times, and not for a couple of months. So it seemed like a wise precaution. First I took him in the stall, which is where I backed him originally. He obviously remembered and was very good. But I had forgotten how soft he is. You can’t tighten up the reins while you mount or he backs up. 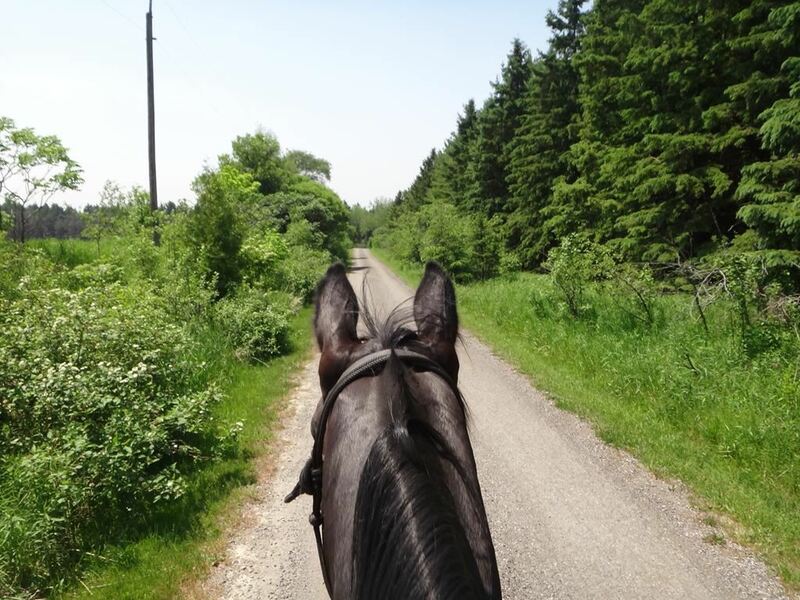 He will stand perfectly on a loose rein though, so it’s just a matter of remembering. I got on and off him a couple of times in the stall. Walked him around a few times in each direction. Then got off and took him to the round pen. He stood perfectly out there too, so long as I left those reins loose enough that there was no contact. He doesn’t flinch or worry about me getting on him. In fact, I think he kind of likes it. He always keeps one ear back listening to me. I got him walking around in both directions. He’s very bendy. Like a little wiggle worm under me. Dressy is very long, straight and solid. King is powerful and agile. Ares is sort of sinewy. His stride is very long. Longer than either King or Dressy I think. I can feel how far he tracks behind and it’s a bit strange to ride. Especially since he’s quite little. I doubt if he’s 15hh. He feels rather like Foxy Baronessa actually. Though he looks nothing like her. He has the same super soft mouth and natural flexion that she has. When I ask for bend, it doesn’t feel like I’m contacting him at all, he just tips his nose right in and bends around my leg. At one point I put a bit of extra leg on to see what would happen and he started sidepassing immediately. So I think he’s going to be an awfully nice horse to ride when he’s got a few miles on him. After a while, I got off and opened up the gate. Got back on (he still stood perfectly), and rode him out on to the lawn. Did a few circles around, then out on the driveway for a little walk. Went down to Sue’s driveway, past a culvert. That was a big moment for Ares. He says he’s never seen a culvert before. And they should NOT be allowed. However, although he was scared, all he did was stop and goggle at it. I asked him to go by, and he did a bit of a sideways slither and scoot, but it was controlled and he went where I asked him (with a bit of soft snorting). Then we had to go past a pile of gravel. Again we did a bit of a slither. And then a slight scoot when he took me under a branch and it made weird leafy noises. But it was controlled and he does respond to both rein and leg even when he’s worried. We came back up the driveway, and I allowed him to go a little bit faster up the hill. It was sort of a pacing walk I think. Quick but very smooth. He’s not a particularly high headed horse it seems. He was quite flexed at the poll the entire ride. And very responsive. He was quite proud of himself when we finished. Fluttered his eyelashes at me and preened. 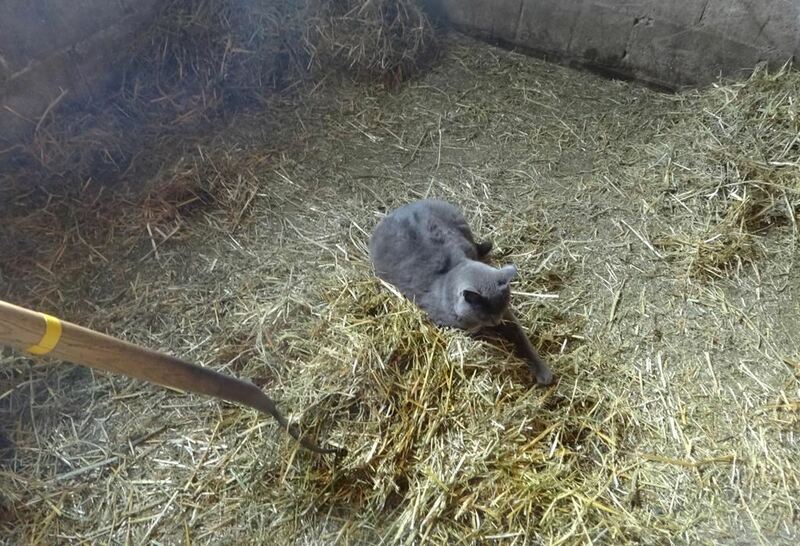 Then had a good roll in the stall to get shavings stuck all over himself. Can’t be looking TOO tidy…. I called Guelph this morning to make sure Dressy was ready to come home. Talked to one of the vets on the case. He told me she was in good shape. Though he repeated again (with what I could tell was a bit of puzzlement) that she has a really pronounced second degree AV block. And again, I told him that she had always had it. I finally had to tell him that she’s rather notorious for it, and is in fact used as an example by the P/R crew at rides to teach beginners with a stethoscope what it sounds like. I told him that I’ve never ever listened to her at rest that she didn’t drop at least every fourth beat. He seemed to be mollified after that, and said it must be because she’s been so fit for her entire life. I headed out with the trailer as soon as I got the okay. It was a much easier drive on a Sunday morning than Thursday morning. Rush hour through Toronto is unpleasant even with a car. With a truck and a 4 horse trailer, it’s very frustrating. So today’s drive was a big improvement. The trip was an hour and a half (as opposed to two and half on Thursday!). The clinic was pretty quiet when I arrived. Just the weekend staff there. I got Dressy’s discharge papers and headed back to get her, but she was already being brought up. She came marching around a corner, with the student a bit more in tow than leading her. The vet gave me some instructions and a bundle of doses of potassium chloride to start her on. Meanwhile, Dressy was dragging the student out to her trailer. We got to the parking lot and I was still chatting to the vet, so Dressy starting doing circles around the student. Zoom. Zoom… ZOOM. I finally had to stop talking and load her. Or really… just let Dressy barge up the ramp and back herself into her spot. “Put up the chest bar and let’s get this show on the road!! !” Dressy told me. The students and the vet were quite entertained by her performance. This was a different vet than the one on the phone, and she again told me with a bit of puzzlement that the mare has a really pronounced AV block. So I again told her that Dressy is well known for this, and has always had it. AV blocks are not uncommon. But it seems to be less common for it to be so consistently apparent, even when she’s not completely relaxed. It works to our advantage in competition, especially in competitive trail where heart rates are scored. When her heart rate drops and starts skipping beats, she can quite easily get pulses below 40bpm. We pulled in to a deafening chorus of neighs from her adoring subjects. King was the loudest of the lot. They obviously knew who was about to come off that trailer and were thrilled to have her home. I can’t imagine why, since she is not nice to any of them. But there they all were, ready to fawn all over her. Getting her off the trailer was a bit of a scramble, since she was in more of a hurry than usual and I fumbled the rope and almost fell down keeping up with the big barging moose. She is in her stall now. Not happy that she’s not out dominating her minions, but more content than being stuck in the vet clinic I imagine. If anyone is interested in technical details, here are some excerpts from her discharge paperwork. Diagnosis: Atrial Fibrillation – resolved. Mild right atrioventricular (tricuspid) valvular regurgitation. Tests: Physical examination, plasma troponin levels, venous blood gas and electrolyte analysis, packed cell volume, plasma total solids, echocardiography, electrocardiogram. Treatments: Transvenous electrocardioversion (TVEC) under general anesthesia, sedation (xylazine and butorphanol), anti-inflammatory therapy (phenylbutazone), oral potassium chloride. Exercise: The horse can gradually resume normal exercise regimen after five days of rest. Diet: As usual, adapted to her exercise regimen. Medication: Potassium chloride: Administer 50g orally twice daily indefinitely. Follow Up: Please monitor the insertion sites over both jugular veins for increased heat, pain or swelling. If any of these signs occur, please contact your veterinarian as soon as possible. The amount of swelling present is normal for 48 hours post procedure. This needs to be monitored closely and kept clean and free of flies as much as possible. Monitor the horse for signs of colic, depression, diarrhea or exercise intolerance. Please contact your vet if you have any concerns. Routine blood work was performed on the mare in prevision of the TVEC procedure and there were no significant abnormalities present. An intravenous catheter was placed in the mare’s left jugular vein. The horse was sedated with xylazine and two electrodes were introduced through the right jugular vein into the heart with the aim to position them in the left pulmonary artery and right atrium, respectively, under pressure wave form and ultrasound guidance. Once the electrodes were in place, general anesthesia was induced and a radiograph of the chest was performed to verify the position of the catheters. Cardioversion was successful at 250 KJ of energy. 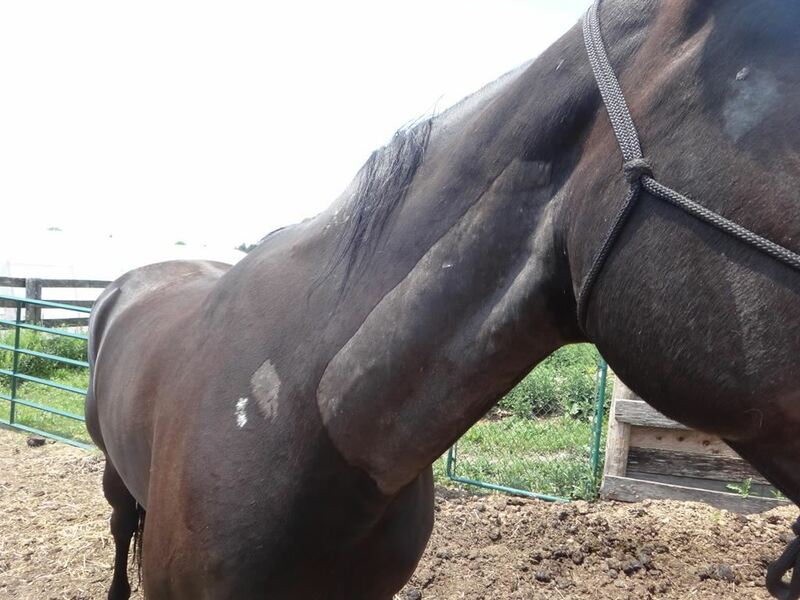 The horse recovered from anesthesia and was returned to her stall. She received phenylbutazone following the procedure. Serial ECGs were performed over the next two days to confirm that the horse’s heart is in sinus rhythm. There was a second degree atrioventricular block present with P-waves and no fibrillation waves. The mare remained bright and alert with normal vital parameters, ate well and passed normal manure for the remainder of her hospitalization. The amount of swelling over the right jugular vein is normal following the electrode introduction. The vet from Guelph called late this afternoon. Dressy came through the procedure well. She woke up from the anesthesia without incident. Her heart is back in normal sinus rhythm. I can pick her up on Sunday. Damn. Just talked to Guelph. They had some emergencies and did not get to Dressy this morning. They are planning on starting in about half an hour. Which means at least another three hours before I hear anything at all. I’m going over to Spring Ride. I’m supposed to give the ride talk for Set Speed tonight. I’ll have my phone with me. So I may as well go now instead of sitting around chewing my nails and frazzling myself. I took Dressy to Guelph this morning. They did an EKG on her and confirmed that she has Atrial Fibrillation. They did a full physical exam, and also an Ultrasound of her heart. There are no complications of any kind, and she is “disgustingly healthy”. That’s a quote. She has a bit of leakage from one valve (not sure which one), which the vet said was normal and that if she hadn’t had it she wouldn’t have been a Standardbred. Apparently every Standardbred they check has a slight leakage (heart murmur). They offered two options. Drug treatment or electrical shock to restart her heart. The drug treatment starts out with a test dose to see if she is allergic to the drug (quite a few are). The test dose is about $500. Occasionally a horse will convert just on that alone. But generally not. Then they give the real dose every two hours until conversion occurs. Each dose costs that much more. The horse almost always gets sick. Sometimes they colic. Sometimes founder. Lots of bad side effects. Sometimes the horse dies. Success rate is 70-80%. The shock treatment itself has no side effects. However the horse has to go under general anesthesia. Which does sometimes have its own problems. Success rate from shock therapy is around 97%. But… ack. $1800. Not a nice decision to have to make. However, with the help of some creative financing and a really terrific boss, I figured out a way to pay for all this. And opted for the shock treatment. I felt a bit sick thinking of putting her through the drug treatment when there was a much better option. I am going to be living on KD for a long time, but with luck, it will be worth it. I left Dressy there, and they will do the procedure in the morning. I will hear the results by around noon or so. If all goes well, I will pick her up on Sunday. And, believe it or not, I will be able to put her back into full work within a few days after that. Though I think, despite what they tell me, I might go kind of easy for a while! I asked what could have caused the fibrillation. They did not think it was anything in her feed, none of her supplements, nor anything to do with speed or exertion at Aprilfest. 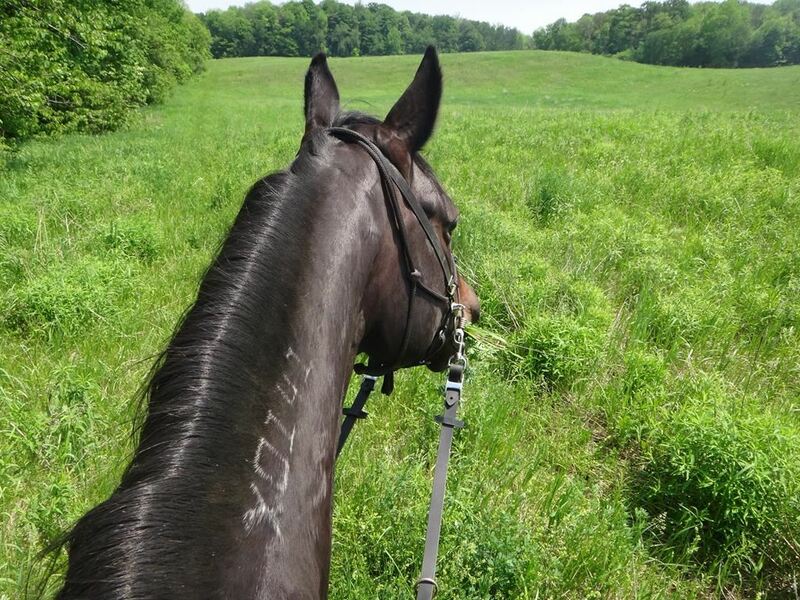 The biggest single factor is just that she is a Standardbred. It’s far FAR more common in Standardbreds than in any other breed. The other factor that Dr Physick-Sheard zeroed in on is Dressy’s personality. He thinks that probably her intensity is the main trigger. The whole race-brain thing that has been haunting us lately is probably what tipped her over. They had two management suggestions for me. Neither of which is in any way proven. They are just guessing that it might possibly help. One is extra potassium every day. And probably to continue giving very large doses of electrolytes at competitions. Maybe even extra potassium (lite salt) along with the electrolytes. They think low potassium is involved somehow. The other is to never give her any pyrantel-type wormer again. For the rest of her life. There is absolutely NO proof about this. Just that several horses have reverted to Atrial Fibrillation a day or two after worming with a pyrantel wormer. She has not had any lately, so that was not a factor this time. Since there are other wormers available though, I might as well avoid those just in case. The vet checked her race lines to see if it looked like she’d ever had an episode before, but didn’t see anything suspicious. He commented to me that this was exactly the sort of mare who ought to be used as a broodmare. Her race history is quite consistent and she had almost no breaks throughout her 76 race career, which is the sign of a very sound horse. He also commented to the residents and other vets watching that her legs were amazingly clean. I actually knew all that about her (which is why I picked her, way back when). Dressy has always had a cardiac arrhythmia. It’s something called a second degree AV (atrioventricular) block. An AV block is not dangerous or any kind of a problem. 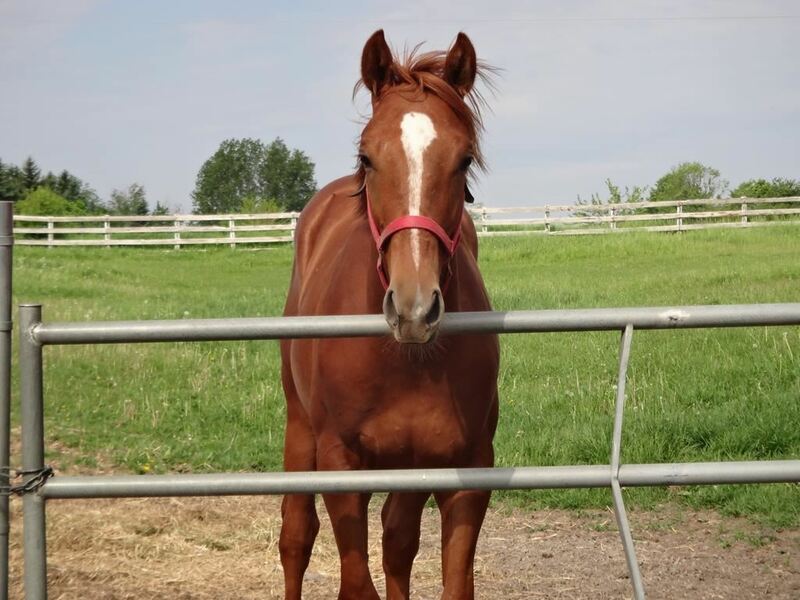 It typically occurs in very fit, athletic horses with efficient hearts. It’s rather as if the heart works so well that it takes a bit of time off in between. An AV block still produces a regular heart beat pattern. It might be three beats/skip/three beats/skip, etc. Or it could be four beats/skip etc. But it’s regular. And the skip pause is exactly the time it would have taken to beat, so it’s right in rhythm. The skip goes away once she starts working. When she first started competing a few years ago, I got a letter from the vet documenting the AV block so that I could request “Stethoscope Only” heart rate checks, since a hand held monitor (known as a ‘wand’) can be inaccurate with arrhythmias. What Dressy has now though is quite different. Her heart beat has become very chaotic. There’s no pattern. Some beats are louder, some quieter. Sometimes you don’t hear a clear lub-dub. It speeds up, slows down, misses one beat, misses three beats. I think, in hindsight, that this probably started at Aprilfest. Our final heart rate at the end of the 25 was 48. Which is quite high for Dressy. At the time I wrote it off to her being a bit tired. But Chrystal pointed out that she should not have been that tired. And she’s right. Dressy has a resting pulse of 28 at home. And it is not unusual for her to have 36 or 40 pulses in competition if she is given time to cool down. She did have 30 minutes. The last person to listen to her heart rate (a PR tech, not a vet), commented that it sounded odd (‘freaky’ was the word she actually used). I didn’t pay much attention, since I very often hear comments from techs at rides because of the AV block. But I guess I should have. I suspect that’s right when it all started. We will find out tomorrow if what she has is Atrial Fibrillation. That’s the most likely diagnosis (and at this point is what I’m hoping for). It would be treated by restarting/shocking her heart back into a normal sinus rhythm. It’s a rather scary procedure, and there are some risks. Sometimes it takes several tries. But assuming she survives being dead, the prognosis is pretty good in most cases. She’d have a short recovery period and then could go right back to doing what she’s always done. We will find out tomorrow what we are dealing with. If what she has is not AF, then things would likely not look nearly so good. Got the info on Dressy’s appointment. Thursday morning at 11 am in Guelph at the University’s large animal clinic. The woman from the vet’s office who called tells me that the appointment is with Dr Sheard, who she says is the Cardio God. So Dressy will be in good hands. I might be hyperventilating a little bit. Over the weekend I checked Dressy’s heart often. Possibly even obsessively. She really never sounded right. Sometimes a bit better than other times. But not normal. I called my vet this morning first thing. He came out to check her. Listened to her heart. Heard the same thing I did. Had me trot her out. Listened again. Said it got much worse after that short little trot. And she was already huffing and puffing. He’s making an appointment for Dressy to go to Guelph (to the University vet clinic) for assessment. Her heart is not sounding right. He is not sure exactly what is going on, but one possibility is Atrial Fibrillation (which is serious but probably treatable). Whatever it is, Dressy is out of action for a while. Definitely no fifty on Saturday.